There are various ways to predict the future. Truly, if you are thirsty for this, some methods such as reading Horoscope, gazing into Crystal Ball, using Tea Leaves will lend you a hand. When it comes to Tarot card reading, this topic always gets special attention from everyone around the world. Some people have been skeptical of these cards’ power, but the ideas of using cards to get a glimpse of the future has often generated fun and interest by virtue of its mysteries and attraction. 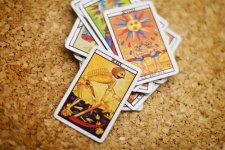 Tarot card readings are used to gain insights into our future. We have a tendency to turn to these cards to get a better understanding of the events around our life cycle. Coupled with using her gifted intuition, a reader will deal with these cards to reveal some aspects of our life such as health, family concerns, career, relationship, etc. While we learn to interpret Tarot cards, there will be those who are endowed with the innate gifts for reading these cards. One of the most common Tarot cards widely applied by the readers for spiritual prediction is the Rider-Waite deck. We can realize them by some simple drawings on the cards’ face. Other popular decks are the Mythic Tarot and Book of Thoth decks. The Mythic deck will take advantage of the Greek mythology, its features and characters while the Book of Thoth deck will make use of the Zodiac signs and astrology signs. The Horse-shoe layout is considered as the most popular one. 7 cards will be laid out in the half circle. A reader will turn them over from left to right. Besides, the symbols on these cards will give us the answers to some crucial questions about past and future. Another layout used by dozens of the readers is the Tetractys. With this layout, Tarot cards will be laid out in 4 rows with the shape of the pyramid. Each row will symbolize Fire, Water, Air and Earth. When we want to read different Tarot cards and layouts, it will be a wise idea for us to follow some tips below. During the process of Tarot reading, it is highly significant to keep the place of work quiet and silent. The room where the Tarot reading happens should not be bright. Therefore, we can curtain a room in order to make it dim. As soon as shuffling these cards, we have to focus on them completely. It is better for a reader to concentrate on cards and the queries that need to be answered. One of the most significant things to keep in mind is to never cross our arms or legs. This will be applied to those who are present in the room. The fist thing that always takes place at the Tarot card reading is that a reader is going to shuffle the cards. Obviously, cards will be laid out at the front of us in the particular layout and face down. While shuffling, we should concentrate our mind on our questions/concerns that we are getting stuck. After we finish reading the cards, don’t hesitate to collect their sets and then place them in the dark and silent corner. There is known as an energy association since the Tarot cards are often handled by the reader. Try to contact a gifted and experienced reader who has expertise in this field so that we can learn many valuable things from her as well as get the best results. For additional details about this article “What Is Tarot Card Prediction?”, please type all of your questions in the box below.